The easiest maneuver to include in your game plan is to have each family member close the lid before flushing the toilet. Otherwise, tiny, microscopic particles will fly around your bathroom with every flush. Clear counters and shelves of everything you don’t absolutely need to store in the bathroom. Pitch candles you never use or soaps you don’t like. Next, empty the vanity. Without looking, I guarantee there’s lots of stuff stashed in your bathroom vanity that you no longer need, use or want. Ditch the excess. How many curling irons does one human being need? Take stock. Sure, we like to have extra items on-hand just in case, but only store what you reasonably need in the vanity, which I will now label your prime real estate. Assess volume. How many hotel samples do you have? How many razor blades do you need this month? How many rolls of toilet paper do you need to have on hand? Consider storing extra items elsewhere. Perhaps the linen closet? Zone the vanity for the items you absolutely, positively need to use in the bathroom, focusing on what you need day-in and day-out. Figure out what items should be stored high (in medicine chests) or low (under the sink). Group like with like and determine the best containers to store your zoned items, keeping in mind easy access and corralling items that tend to multiply, like Q-tips. Select fun, practical bins, fill them and complete the look with labels. Then, tuck each one in its rightful space. Take stock of your bath towels, bath mats and shower curtains. Donate the well-worn items to your local animal shelter. 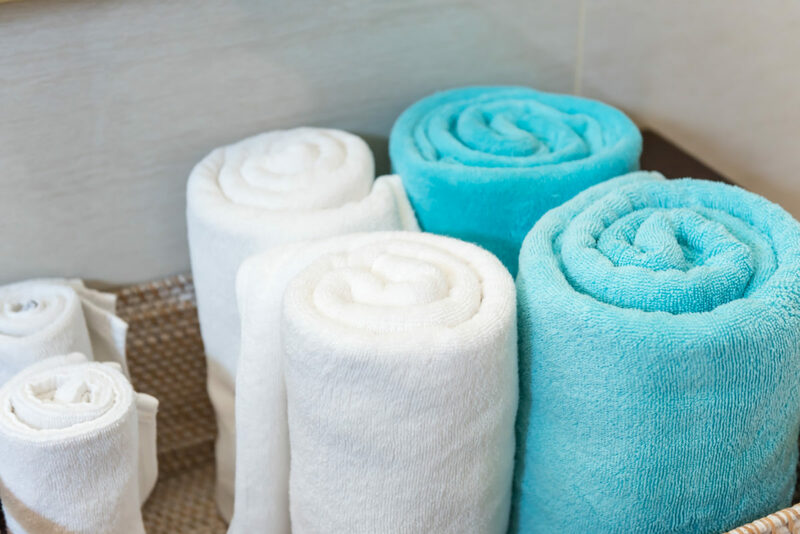 Store the rest in your linen closet or designate a space in the bathroom. I love to roll towels and tuck them in a pretty basket. Finally, attack your bathtub or shower stall. Ditch any products you no longer need, use or want. Corral the rest in caddies, grouping like with like. Clean everything. I repeat, everything. Treat yourself to a nice bubble bath or a steamy, hot shower!